British Prime Minister Tony Blair has welcomed the news, saying it "removes the shadow" hanging over Iraq. Saddam Hussein is the most wanted man on the list issued by US authorities but has not been seen since Baghdad fell to US forces in April. 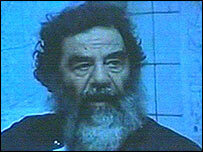 Video footage apparently showing a dishevelled-looking Saddam in custody with a long black beard was shown at the press conference. A spokeswoman for US-led coalition forces in Baghdad said that a "very important" announcement would be made at a news conference at 1200 GMT but would not give further details. Iraqi Governing Council head Abdel-Aziz al-Hakim was quoted as saying that a DNA test had proved the man in custody was Saddam Hussein. The news comes as violence continued in Iraq, with at least 17 people killed and 30 wounded after a powerful car bomb exploded at an Iraqi police station in Khalidiyah, about 35 miles (60 km) west of Baghdad. Saddam Hussein has been the object of intensive searches by US-led forces in Iraq but previous attempts to locate him have proved unsuccessful. People have started celebrating the possible capture of their former president in the streets of Baghdad and the northern Iraqi city of Kirkuk by honking their horns and firing into the air. The former Iraqi leader was last seen in television footage shot in April at a Baghdad market just before the city fell to US forces in the recent Iraq conflict. US authorities have offered a $25m reward for information leading to his capture. On 22 July his sons, Uday and Qusay, were killed in a raid by US forces in the northern city of Mosul. In October, US officials said they had intelligence indicating Saddam Hussein was hiding in Tikrit. They said he seemed to be moving around various safe houses with the aid of family members, often in disguise. Saddam Hussein was born in Tikrit and has a tight network of family and clan ties which permeated all of the regime's main military, security and political institutions while he was in power. Coalition authorities have said that the former Iraqi president, if captured, could be tried at a war crimes tribunal, with Iraqi judges presiding and international legal experts acting as advisers. Saddam deserves a slow and painful death and or if he goes on trial. Hopefully the Arab world will topple. Now they will put him on trial for his crimes against Judeo-American humanity. Excuse me? He deserves a slow and painful death for opposing Isael and fighting to save his country from the conquering Americans? He's a little confused. Probably very young. I wonder when the Jewnited States will stop with their brainwashing propaganda. They are currently really reminding me of Orwell's 1984. In the CNN and BBC reports on TV, every other word used to describe Saddam was: Monster, or Animal, Criminal etc. USA is on a brainwashing spree, it's a dictatorship over the entire world, and no matter what attrocities Saddam may have done, the USA didn't attack Iraq because of war crimes, or secret weapons, or Al-Qaeda, USA invaded Iraq because of oil and because Iraq is a threat to US and Israeli interests in the middle east. Do you really think it is he? Or maybe one of his 10 look-alikes? Doesn't really matter. If the USA convinces the world ( successfully ) that it's Saddam, then it's Saddam. If the USA convinces the world that Serbs are animals, then the Serbs will be animals and Albanians will be the victims. If the USA convinces that in the conflict between Greece and Turkey that Greeks are the uncivilized bad guys, everyone will believe them, they can do whatever they want to. Last edited by Gladstone; Sunday, December 14th, 2003 at 04:47 PM.